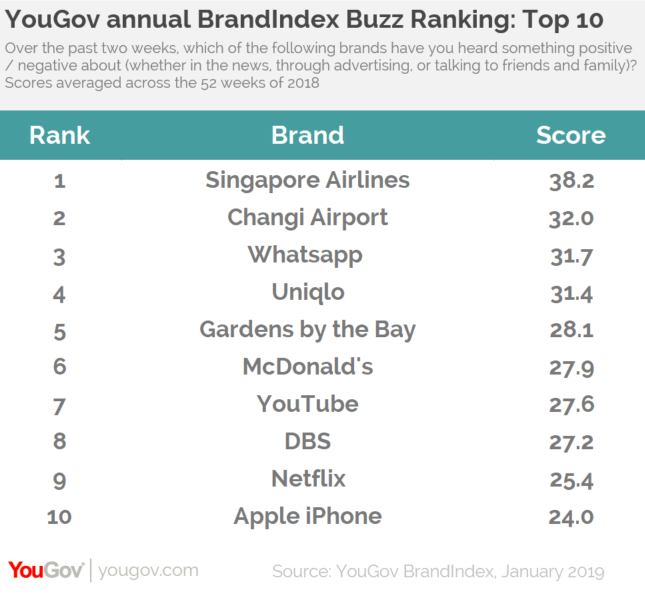 on January 23, 2019, 12:18 p.m.
YouGov’s annual BrandIndex Buzz ranking is dominated by Singaporean brands, with national carrier Singapore Airlines taking the top spot for the fourth year in the row. Singaporean brands have a strong presence in the top ten. Changi Airport comes in second place (32.0), Gardens by the Bay comes in fifth (28.1) and banking instution DBS comes in eighth (27.2). Digital brands also make up a significant proportion of the list. Instant messaging platform Whastapp in third (31.7), video sharing platform YouTube in seventh (27.6), subscription-video-on-demand service Netflix in ninth (25.4), and Apple iPhone in tenth (24.0). The list is completed by Japanese fashion retailer Uniqlo in fourth place (31.4) and quick service restaurant McDonald’s in sixth (27.9). 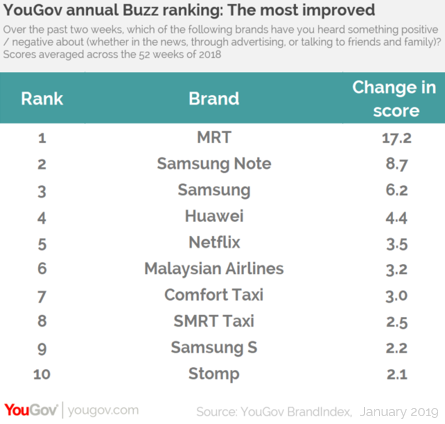 YouGov also reveals which brands have the most improved Buzz score. Multi modal transport operator SMRT comes up top, (a rise of 17.2 points), ahead of smartphone brand Samsung Note (up 8.7 points). The third most improved brand was South Korean smartphone manufacturer Samsung (up 6.2 points). 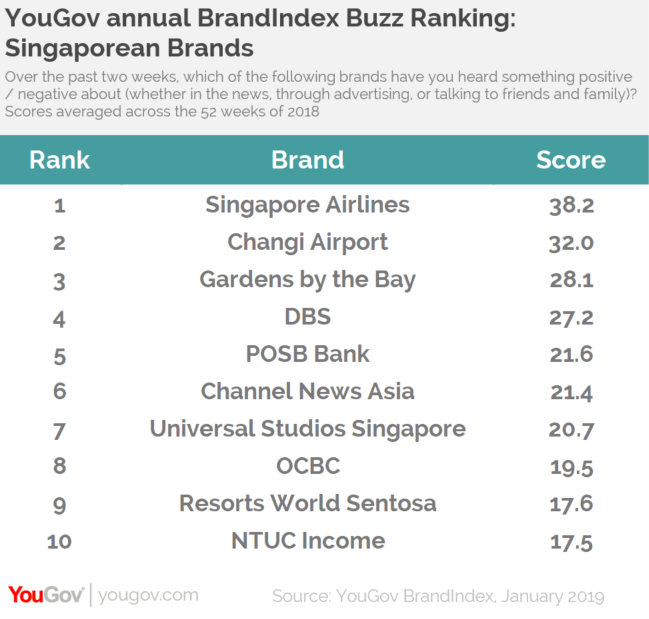 In addition to unveling the brands with the best buzz overall, YouGov also measured the Singaporean brands with the most positive buzz. Singapore Airlines, Changi Airport and Gardens by the Bay make the top three, followed by local banks DBS and POSB (21.6). Pan-Asian news channel Channel News Asia comes in sixth (21.4).